In the 1990's I purchased a used ZI Pentacon camera. From Zeiss-Ikon in East Germany, circa 1948, this was one of the world's very first prism Single Lens Reflex bodies for 35mm film. When I purchased it, the lens that came with it was a Meyer-Optik Gorlitz Primoplan f:1.9 / 58mm. It will focus to 2.5 feet. 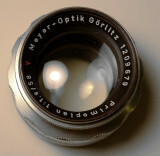 I do not know that this is the original "correct" lens, since I cannot find this lens listed in my Lind's List data book. But it seems appropriate enough for the body. After careful cleaning, I discovered extensive damage to the lens coating on the rearmost facing glass surface of the lens. The front surface is nearly perfect, so the cause for patchy loss of coating on the rear surface is a mystery to me, and not likely due to my cleaning. Oftentimes, rear coating damage will cause strong degradation of quality, with flare, haze, and softening in the images. I have always wanted to see how this damaged lens would perform, but did not want to needlessly waste good film. Today I took the lens, with a m42 to P/K mount adapter, and mounted it to a Pentax K10 D digital body. I did a quick test here at home outside before the sun went down. Actually I was surprised that the lens did as well as it did, the flare in most of the images was not fatal to the images, and the lens showed perfectly adequate sharpness, for a 60-ish year old collection of glass on a contemporary camera body. Now I should be ready to give the ZI Pentacon body a day with film. If anyone can tell me what camera this lens was originally intended for, I will listen. Do not be overly critical of these images, they were intended more for test purposes than for Art. Please click on thumb nail images for enlargement. This Lens was originally found on the early Practicas around 1955. I was given one in East Germany. I was never too happy with the lens, besides I was a novice in photography. In Later years I used it on Edixaflex cameras. Unfortunately, I gave it to a friend of mine who used it 0n his enlarger. It was not a top quality lens, a little soft, but great for portraits. Stopped down it was not too bad. 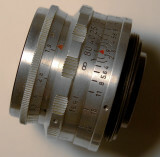 At that time an East German Zess Ikon (Jena), 2.8 50 mm, was a better choice.